Giles Penne was the only son of Thomas Penne of East Coker. In his book 'The Annals of West Coker' Nathan wrote ".... the late Abbot and Convent of the Monastery of Our Lady of Glastonbury were seised of a messuage called 'Penneys' and an orchard and dove house with a curtilage containing altogether 2 acres and 17 acres of pasture at Frontelles Wood in West Coker.... Giles Penny was evidently no longer interested in the messuage called by the name of his family of which the abbot of Glastonbury had been seised. But he was interested in the abbeys of Athelney and Muchelney of which he was standing attorney. The Abbot of Athelney, writing to Thomas Cromwell, the king's secretary, with regard to the debts of his 'poure howse' on 10 April 1536, includes in a long list of them 'xiij s iiij d unto mr penny attornay'.... The attorney was no doubt getting rich apart from the wealth that came to him through his first wife, one Isabell probably a daughter of the house of Gerard of Trent. His second was Anne, daughter of Thomas Newton of East Harptree, whom he married before 1537. In the subsidy is raised between 1543 and 1547 he appears to have been called upon to make a higher payments than any other man of property in the Coker parishes. Of your charite pray for the soules of Gyles Penne gentilman and Isabell his wyf whiche Gyles deceased the day of in the yere of our lord god MV and the seid Isabell decessed the xij day of December the yere of our lord god MXxjx on whose soules Jhu have Mercy Amen. The brass having been laid down by the husband after his wife's death and before his own, the date of his decease was not subsequently added, a very unusual omission in memorials of this type. A rubbing of the Penne Brass in St John's church. 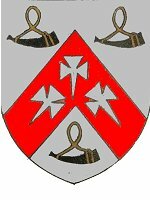 These arms are shown on the brass of Gyles and Isabell Penne in St John's church, through the arms of Gyles' mother's family, the Crewkernes of Childhay, Dorset. The tinctures shown here are as recorded in 1633 by Gerard. The arms are argent, on a chevron gules, between three bugle horns sable stringed or, as many cross crosslets patèe fitchee argent (on a silver ground, a red chevron between three black bugle horns with golden strings, three silver crosses with spreading ends and pointed lower ends). "Giles Penne is represented as clean-shaven, with long, straight hair brushed over the forehead and reaching to the shoulders. He wears a long that fur-lined gown confined by a plain waist-band, the sleeves very full and showing the fur lining inside. The tight sleeves and plain collar of the doublet are seen at the wrists and on the neck. The fleet, which rest on a mound of grass, wear large round-toed shoes. His wife Isabella wears the kennel head-dress with front lappets ornamented by a lozengy pattern; with this is worn a close-fitting gown open at the neck with a turned-back collar, the tight sleeves ending in cuffs of fur. Round the hips a loose girdle, ornamented with pierced circles between two dots in each interval, is fastened by a buckle. Reaching almost to the feet, it ends in a metal tag with a crown-like top and a lozengy pattern. A little rose hangs from it by a ring. The ample skirt edged with fur nearly covers the large square-toed shoes. 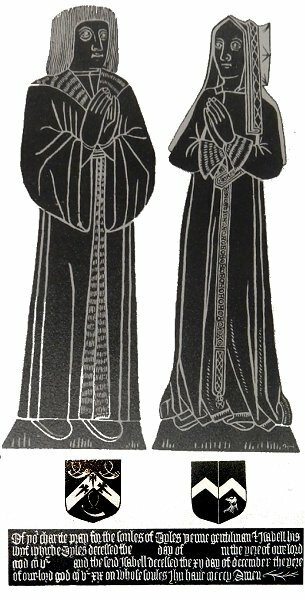 Giles Penny married Isabell Gerard of Trent but she died without issue, on 12 December 1519, and was buried in St John's church, Yeovil. Giles was attorney to several religious houses at the time of the Dissolution, including Athelney and Muchelney (as mentioned above) but also Sherborne and Bruton. He died in 1560 possessed of considerable landed property and was buried at East Coker. In his will he signed his name Peny; on his first wife's brass his name was given as Penne and in various Letters and Papers of Henry VIII, the name is written Penny. Giles' second wife was Anne Newton, daughter of Thomas Newton Esq. of East Harptree, Somerset. They had four children; Giles (1537-1595), Edith (who married John Huntley of Milborne St Andrew), Alice (who married John Daubeney of Gorwell) and Joan (who married Hugh Daubeney of Wayford). Item, Received at the buryinge of Mistresse Pennye for alle ye Belles 3s 4d. Item Paid for 5 peckes of lyme for to sette ye stone in ye Chauncelle over Mistresse Pennye's grave 5d.